A list of my published poems is below. Many are available to read online. Please also consider purchasing from, or donating to, these amazing literary organizations, presses, magazines, and journals, who have recently supported and published my work. Click here to order my most recent chapbook Footnote ($12 free shipping, Lithic Press). The books will be ready in July! You can read all about how the book came to be in my interview with Nancy Chen Long in her series Chapbook Chat. Rock Canyon Poets: Orogeny, Vol, 4. $10.00. Orogeny, Vol. 1. 2, 3 $5.00. I’m honored to be the co-founder of this non-profit group of Utah poets, as well as Editor-in-Chief of our annual poetry collection. NEW!! Women Speak: Portraits, Poetry, and Prose of the Feminine Experience, Nancy Smith Fine Art. $24.99 in full color 8 x 11. Shake The Tree (2018-2019), Brightly Press. $40.00. Huge volume of teachable work with essays/interviews from the poets/writers. Features CA Conrad, Sam Ligon, Natalie Diaz, & many more! Shabda Press: Nuclear Impact: Broken Atoms in Our Hands. $25.00. Proceeds from the anthology are being donated to the Women’s Center in Downtown Los Angeles. Sable Books: Red Sky. $19.99. All proceeds will be directed to the Global Fund for Women. Snapdragon: A Journal of Art & Healing: The Art of Creating, Winter 2015 issue, 1.4. $5.00. Noctua Review: Issue IX. Free online. Noctua Review is the annual art and literary magazine produced by the Southern Connecticut State University MFA program. The Next State, Denial, and What. 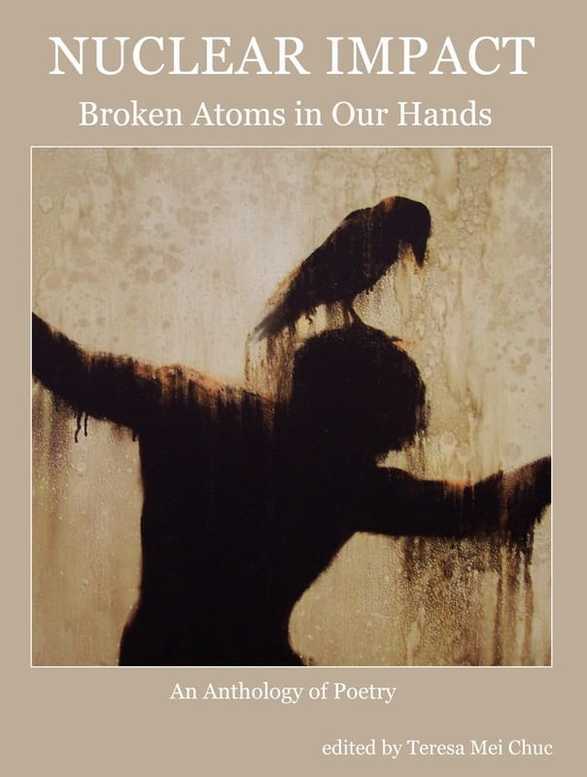 Nuclear Impact: Broken Atoms in Our Hands. Thanks Tiegan! I’ll check it out. I’m honored! Thank you so much for reading Rick and for your kind comments! Keep submitting… my acceptance rate is usually right around 10%. Finding the right place for poems is tricky business! Indeed! Submitting a lot helps, but it’s also finding that perfect combination of the lit mag that happens to love the poem you sent. I swear, most of the time they pick the ones I throw in at the last minute on a whim, rather than the ones I think they will pick! Thanks for the update :).